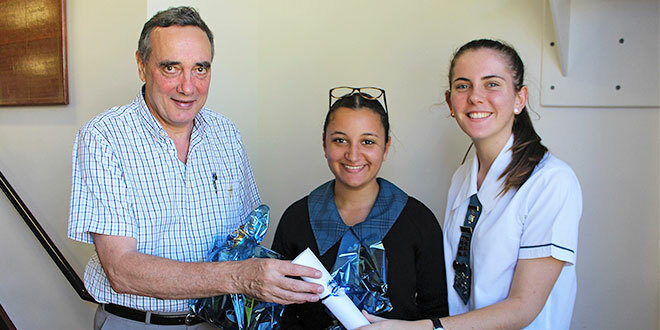 Farewell: Capricorn Coast parish priest Fr Peter Tonti was presented with farewell gifts by college captains Rubyanna Cozzi and Courtney Fisher. CAPRICORN Coast parish priest Fr Peter Tonti was farewelled by the staff and students at St Ursula’s College, Yeppoon, in May. Fr Tonti was presented with gifts by College Captains Rubyanna Cozzi, Natalie Cook, and Courtney Fisher, at a school assembly in the Ballygriffin Cultural Centre. An audio-visual presentation featured memories of the many Masses and special occasions Fr Tonti had celebrated with college community, as well as words of thanks from the students and staff. At the conclusion of the presentation, the audience stood and extended their arms towards Fr Tonti, offering an Irish Blessing. Fr Tonti responded with heartfelt thanks, and encouraged the students to use the education they have gained from the college – to go out and make a different in the world. “Remember that you each have unique gifts to share,” Fr Tonti said. St Ursula’s College, Yeppoon, principal Catherine Dunbar, spoke of Fr Tonti’s kindness and sincerity, and thanked him for his service to the whole school community over the past two years. “Fr Peter will be missed by students and staff of the College, especially because of his gentle approach, his willingness to engage in school liturgies, and his welcoming presence,” Mrs Dunbar said. He will assume the role of parish priest of the Bundaberg community. Meanwhile, the Centenary countdown is on for St Ursula’s. Opened as a primary school in January 1917 by the Presentation Sisters, the college grew in 1918 to include Secondary education and Boarding facilities for girls. The coming 18 months will see a host of activities to celebrate the history of the College. In July 2017, St Ursula’s College, Yeppoon will host a celebratory Mass to acknowledge 100 years of Presentation presence and Catholic education on the Capricorn Coast, a tribute to the pioneering Presentation Sisters who founded the school. Centenary Celebrations will culminate in a three-day extravaganza during the May Day long weekend in 2018, as past and present students, staff, and community members gather to celebrate 100 years since the secondary college opened in 1918. Past students and staff are invited to register their details to receive updates regarding the Centenary Celebrations, by emailing catherinew@stursulas.qld.edu.au, or writing to the Past Students’ Registrar, LMB 600, Yeppoon 4703.